Somehow I got roped into leading the Safe Routes to School program at Ellie’s school. Most of the time it’s boring stuff like going to Town Council meetings and asking for sidewalks and stop signs. But last week was the Vienna Bike/Walk Challenge. All of the elementary schools in Vienna tried to have the highest proportion of their students walk or bike to school. 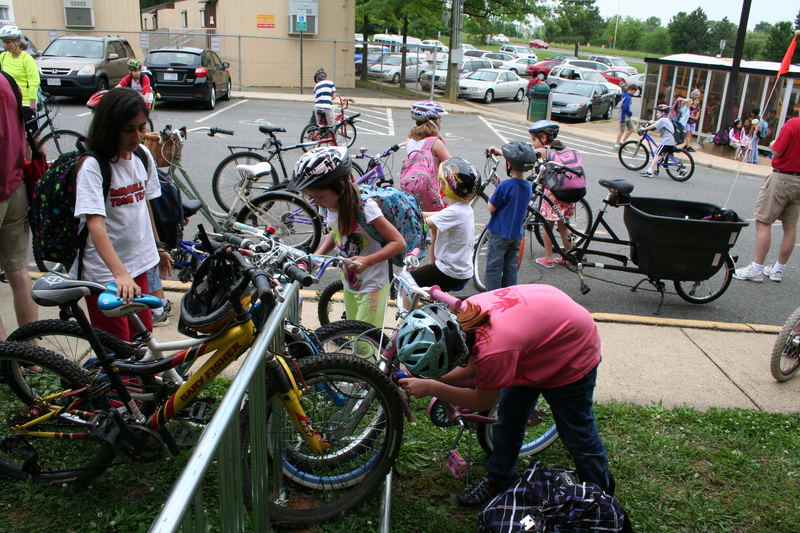 One of Marshall Road ES’ strategies was for me to lead a “bike train” to and from school every day. This is what it looked like. Kids locking up their bikes in the morning. The racks were jammed full every nice day. We may need to get more. Getting ready to head home after school. The students were remarkably well-behaved, even in the tight space here. Stopping at the stop sign. Always obey traffic signs and follow the rules. The kids had a great time, and in our first year back doing the challenge, we had the second highest number of overall walkers and bikers, as well as the second highest number of bikers. Not too shabby considering we didn’t even have bike racks at our school until March!